If you are metal detecting in Hawaii, be sure to follow the State Laws of Antiquities. There are a few laws to be aware of, especially when digging on State or Federal Lands. 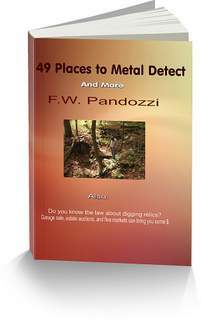 The laws below may sound confusing, and cause you to rethink your desire to metal detect. Don't let these laws stop you. Remember, they only pertain to State or Federal lands. When you are metal detecting on private property you only need to ask for permission from the property owner. The first law is the Antiquities Act of 1906. Archaeological Resources Protection Act (ARPA) ARPA was enacted by Congress in 1979 to protect our nation's archaeological resources located on public lands. This law provides for punishment of individuals who knowingly loot or vandalize archaeological sites by imposing stiff fines, imprisonment, and confiscation of artifacts as well as tools and vehicles used in the violation. Although ARPA does not apply to state lands, the passage of this law paved the way for states, including Hawaii, to enact similar laws for the protection of cultural resources located on state lands. ARPA was the signature law that set the standards in every State when it came to the digging of and the removal of any artifacts. If you plan on detecting in Hawaii parks, you should check with each town or village to see what their policies are like. You should also check the State's National Historic Preservation Act Law. Of course the sand beaches of Hawaii may also be detected. Have you visited my homepage? Metal Detecting Ghost Towns Of The East? Just click the link below. Metal detecting in Hawaii is as much fun as ghost town detecting.